It's rather difficult to write this page without sounding all corny and pompous. Or just like everyone else. So instead of a few blah blah me-too paragraphs to waste your precious time, here's a note from Chris, our director. When I was little, my ambitions were just like any other kid. I'd be an astronaut, a football player, a fireman, a rock star, a pirate. Those professions didn't quite pan-out for me, but just like back then, I still wake up each morning with the same genuine childlike excitement about what the day will bring. I started out with this (possibly annoying) enthusiasm back in 2002, training up new technicians for a leading UK soft furnishings cleaning company and helping new franchises get up and running. I enjoyed great results and got an invaluable cleaning and business education, so I had everything I needed to set up Advanced Clean in 2008. Since then I've built a business I am very proud of, and although I'm not a pirate, I'm honoured to have a big reputation. I demand not only the very best technicians, but people who I know you'll find a pleasure to have in your home. Enthusiastic, caring, skilled and motivated people are infectious and this is what makes the difference. We're passionate about what we do and I think this is why so many of my customers recommend us to others. I hope that you get a sense of our passion from these web pages. If you haven't read them already, you'll find our service promises below. I'd love the opportunity to show you how we live up to our reputation, and leave you with carpets and upholstery to enjoy and be proud of. If we don’t do what we say we will, we’ll return to put it right. If we can’t, then your clean is free. We've worked on all areas of our business to ensure you get the best possible clean and exemplary customer service too. 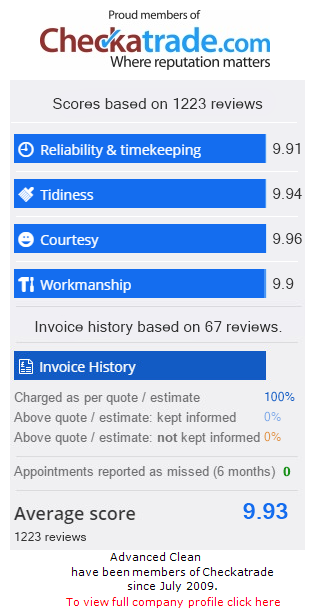 This is why our Checkatrade customers rate us so highly for tidiness, reliability and timekeeping, courtesy and workmanship. So we can confidently make these service promises to you. All of our technicians have met the demanding standards set by a qualified NCCA trainer. We’ve even passed accreditation exams. Our experience means we have the right answers and techniques to do the best job. Our expertise means we'll do a great job. We always test for colourfastness, shrinkage and pile damage before cleaning. We treat your carpets, rugs, sofa, curtains, mattresses, fabric and leather upholstery like our own. We never miss a step. We treat you and your home with thoughtful respect, so we're also fully insured to safeguard your belongings. We know that hard graft on its own is not enough. So reinvesting in technology, training and our staff is key to our success and your happiness. So we are skilled in many techniques; be it hot water extraction, low moisture cleaning or dry cleaning. We use the best cleaning solutions with excellent cleaning power that won’t leave a dirt-attracting, sticky residue. We use the most advanced, highest spec cleaning systems to give you a superb clean. We don’t use harsh chemicals or detergents. We use only hot water and eco-friendly solutions, disposed of down the drain. There’s no harm to the environment in their production or disposal. So they are kind to your home too, safe for your children and pets. Our equipment is powerful but energy efficient, requiring mains power only. Get in touch for your free carpet, rug, sofa, curtains, mattresses, and fabric and leather upholstery cleaning quotation today. We can give indicative costs over the phone, but sometimes it's best to organise a free home visit so we can discuss the most appropriate cleaning approach and give you a fixed cost. Don't forget, we promise you a 100% satisfaction guarantee on your clean. We are proud of our feedback and we work hard to ensure it stays that way. The National Carpet Cleaners Association is a UK trade association dedicated to excellence in cleaning of carpets and soft furnishings. As members we follow the NCCA code of practise, meet best practise guidelines, we are fully insured and we employ only professionally trained technicians. The NCCA requirements give you assurance we meet the highest standards of professionalism and competency in carpet and upholstery cleaning. Checkatrade is an impartial and independent directory of UK tradesmen and companies. As a member, we're vetted to extremely high standards and honest feedback from past customers is widely available. This means you can get a great feel for who we are and how we work. We have worked hard to build and maintain our solid reputation, and we're proud of it. You can read what our customers say about us on Checkatrade. The Approved Carpet Cleaners Association is a UK trade association dedicated to promoting and improving the standards of professional carpet cleaning to the public in their local areas. Members must embody the passion, knowledge, value for money, high standards and cleaning approaches that TACCA represent. We are proud members of TACCA and we share these values whole-heartedly.